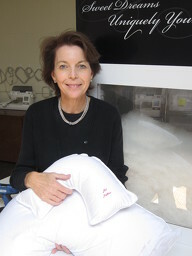 The Home Trust: What first compelled you to enter the pillow industry? Merrimac Dillon: My husband had very serious back surgery and I was thrown into a world of Chiropractors and Neurosurgeons. After several surgeries and lots of time spent working with the doctors, I asked them about the best mattress and pillows for the best neck and spine health. They all scoffed and said there was nothing on the market they could recommend in the pillow category. So…as we all know, necessity is the mother of invention, so I spent a year in their sleep clinics and testing pillow fills with their input. We settled on 650 Hungarian down, which allowed us to create not only a luxurious product but one that is “Luxury with a Purpose” -then we have built on that base to provide customers with the perfect pillows and luxury accessories for both sleep and travel. MD: I am everyday inspired by the many customers and stores that give us overwhelmingly positive feedback about our personalization and product performance. So many say we have changed their lives –who could ask for more positive inspiration than that?! THT: I can’t imagine a nicer complement. What is the best advice you ever received? MD: My father always told me that Attitude, Integrity, Accomplishment, Love and Faith will guide you. But be flexible to respond to your customers’ needs and have patience. MD: Attention to detail and caring about your customers. THT: What makes a room (or building design or your product category) sing? MD: The perfect harmony of color, texture and luxury. THT: To create the world’s finest pillow is no small accomplishment. What makes a great organization? MD: Without a doubt, the team you assemble and the style in which you lead them every day. THT: Why The Home Trust? MD: We wanted to market our unique custom products with others who understand luxury and attention to detail. THT: Thank you. You’ve found a home and we’re proud that you’ve joined us. Anything else you’d like to add?